Used by most UK Police Forces and Military abroad. Cameras on dogs were first designed and manufactured by Goodman Bentley in 1988 after a serious firearms incident at Hungerford in the UK which resulted in serious loss of life. It won a prestigious Home Office Police Award for its operational effectiveness and providing officer safety, and was presented to Gil Boyd by the then Home Secretary Kenneth Clarke MP. It has since been used on many major operations to quickly search buildings for people at home and abroad, saving countless hours of valuable search time. With technology becoming smaller, and batteries following the trend for miniaturisation, the components used in WOLVES 3 are of a compact design, compared to the early days of the original WOLVES equipment shown to Her Majesty The Queen on the right hand picture where the dog is wearing a body harness with integral batteries. WOLVES 3 is the latest low cost concept from Goodman Bentley's original WOLVES system, which utilises a miniature colour pinhole camera with onboard audio coupled to a microwave transmitter using a Lithium battery within one small unit, providing 5 hours of continuous use, with the option of 4 separate channels on the transmitter, so four dogs can operate in one location at the same time, with their own head or muzzle fitted camera transmitter. Many Law Enforcement & Military operations are supported by natural or overt lighting, so this system utilises a 1/2" colour chip to provide the best identification of the target area to be searched. 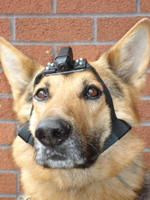 The decision to use a colour camera instead of a monochrome one on WOLVES 3, was based on the operational findings and statistics from Firearms Support and Military Dog units in theatre. WOLVES being shown to Her Majesty the Queen on the opening of the new Police Headquarters in Norfolk. (Picture courtesy of Norfolk Police Press Office)also lower picture on the right, showing FELIX Bomb Disposal Officers using WOLVES in EOD work in Northern Ireland next to the more common wheelbarrow. WOLVES 3 does not utilise a battery waistcoat or battery collar, like other makers who have copied our system. The whole unit weighs just 40 grammes and simply fixed by an adjustable bracket to the head harness or on one side of the muzzle, which can be adjusted to suit different breeds. This small camera unit is also available for officers involved in CBRN or Firearms operations and can be simply removed from the dog harness and fitted to a helmet using Goodman Bentley helmet brackets. 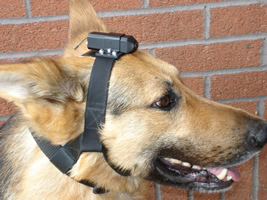 The low, but safe and effective microwave ERP output emissions of the new WOLVES 3 transmitter unit can be used safely by both humans and dogs involved in Firearms or other specialist Military operations involved in the recovery of intelligence from within a stronghold or used externally in open spaces, where by its very nature, the WOLVES 3 transmitter is worn close to the head. This small and cost effective unit has also been used on Television programmes using other animals to produce the video and audio quality received from it. The W.O.L.V.E.S system can also be used highly effectively by EOD search dogs where the traditional wheelbarrow cannot operate. 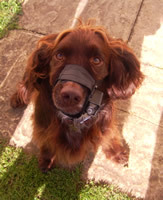 The latest WOLVES MUZZLE camera unit is fitted to a specific muzzle for the breed of dog used in the EOD role.The picture shown is the latest harness worn by Max the Spaniel, who adapted to it within minutes. The camera module is the same unit used throughout the latest WOLVES range of products, and allows four dogs to work at the same time on separate frequencies. Traditionally the Explosive Ordnance Disposal (EOD) Search dog is sent forward of its handler to seek out hidden IED's. This latest muzzle camera and microwave transmitter unit allows the handler to view the images from the dog at a safe distance, and normally more than 200 metres line of site, the safe operating distance for EOD staff. The tough, hard wearing muzzle harness shown with the specially designed steel bracket and the camera in position. The below picture shows Oscar the German Shepherd wearing the traditional WOLVES 3 head harness version. Max the EOD Spaniel wearing the muzzle harness version on the right.